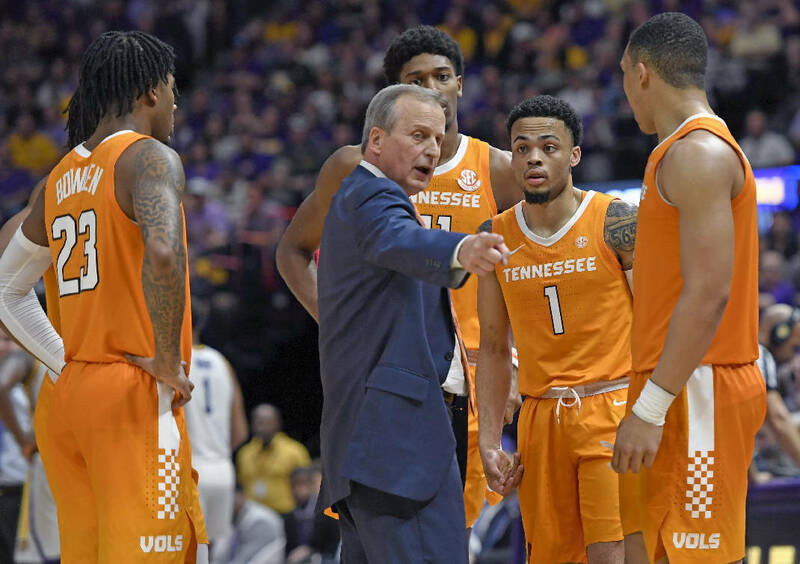 Tennessee men's basketball coach Rick Barnes talks with his players, from left, Jordan Bowden, Kyle Alexander, Lamonte Turner and Grant Williams during their 82-80 overtime loss to LSU on Feb. 23 in Baton Rouge, La. Updated at 2:06 a.m. on Monday, March 18, 2019, with more information. NASHVILLE — Had Tennessee's game Saturday against Kentucky been for the Southeastern Conference championship, there would have been a lot of reasons for excitement entering the NCAA tournament. Instead it was a semifinal, and with the real championship on the line Sunday, the Volunteers couldn't match the previous day's heroics. Auburn used an 18-1 first-half run, built off seven consecutive Tennessee turnovers and missed shots, in building a nine-point halftime lead. The Tigers then went 3-point happy in the second half, knocking down 10 of their 15 second-half attempts from long range in dismantling the Vols 84-64 in the SEC championship game at Bridgestone Arena. It was the second time in eight days the Vols had a chance to beat Auburn to claim an SEC championship, and the second time they failed in that moment. On March 9, Tennessee lost an 84-80 game at Auburn that, if the Vols had won, would have given them a share of the SEC regular-season championship. Sunday's game wasn't that close, as at times the Vols looked like a team that had played its championship a day earlier, when they rallied from eight down in the last three minutes to stun Kentucky 82-78. "It's hard playing at 9 at night, then 2:30 the next day, then noon. That's tough, especially on a Sunday," guard Admiral Schofield said. "It's hard, but at the same time it shouldn't be an excuse or something that's a factor, but it is. "At the same time, we beat ourselves tonight. That's all that went into this game; we beat ourselves turning the ball over." Added coach Rick Barnes: "Right from the beginning, I told the coaches, I said, I thought we looked like we were drained a little bit. I thought the guys tried to do as much as they could before the game, trying to get themselves going, all that. It was a quick turnaround. "With that said, some of those turnovers, I mean, we fumbled passes, passes where guys weren't ready, those type of things. We know they're a team that feels good when they get going." Lamonte Turner had 24 points to lead all scorers, making four 3-pointerss and building on the confidence he gained in knocking down the go-ahead three against the Wildcats Saturday. Grant Williams had 13 points and eight rebounds and Jordan Bone had 11. Jordan Bowden finished with 10. The Vols had 17 turnovers, one off the season high set against Memphis on Dec. 15. Twelve of those came in the first half Sunday, leading to 13 Auburn points. The Tigers entered Sunday's game having averaged 12.7 3-pointers per game during the tournament, and somehow they topped that with 15. Bryce Brown led the Tigers with 19 points and five threes, but he was matched in 3-pointers by Chuma Okeke, who finished with 18 points and 13 rebounds. Danjel Purifoy had 10, including two threes. Jared Harper had six assists in only 19 minutes after a pair of early first-half fouls. The Vols jumped out to an early 10-5 lead on a pair of 3s and two free throws from Turner, and led 17-13 after a Jordan Bowden jumper, but around that time is when the sloppy play began. There were six consecutive possessions with turnovers, and a seventh in which John Fulkerson had his shot blocked, then turned the ball over. They were already mired in a shooting slump, one that reached 8:11 of game time and 10 consecutive misses before Schofield stole the ball from Okeke and laid the ball in before getting fouled. Considering the poor play, the nine-point halftime deficit was a blessing for the Vols. They quickly cut the lead to seven on five quick points from Turner, but the Tigers started to heat up with the second and third of three consecutive 3-pointers to build a 13-point lead. Tennessee did get rolling offensively, making five straight baskets, but their inability to stop the hot-shooting Tigers deemed it pointless as Auburn just continued to build upon their lead. "Give them credit," Barnes said. "They (Auburn) played the game. They deserved to win. Our hats are off to them."